Wednesdays are always great! No, I am not thinking about the weekend already, but it seems quite pleasant when you get some tangible update in the stream of redundant leaks and speculations. In a similar turn of events, we are looking at a video trying to simulate iOS 8 on iPhone 6. The aim here is not to focus merely on the iOS 8 itself but also on the design and usage of larger iPhone. This video tries to have us through the iOS 8 on iPhone 6 which is a 4.7″ model and compares it to other larger phones like Samsung Galaxy S5 and HTC One M8 in the process. As we enter the Q3 of the year, it always gets more heated up than the previous months as leaks and videos keep coming up sharing information based on critical analysis or insider leaks. Apple is highly rumored to release to larger iPhone 6 models this year including a 4.7″ iPhone 6 and another 5.5″ phablet variant which will come in the competition of LG G3 and Note 4. This year, Apple claimed at WWDC that the product line-up would be the best of the past many years. This product line-up includes iPad Air 2, iPad Mini 3, iPhone 6 4.7-inch and 5.5-inch, and an iWatch. While this recent iOS 8 on iPhone 6 video may not be something very new, it is quite exciting to look at a dummy iPhone 6 model running the upcoming iOS 8. Tom Rich compares iOS 8 on iPhone 6 with the one running on current iPhone 5s. The larger iPhone will certainly require more resolution as has been extensively discussed previously. iPhone 6 is expected to sport an ultra-thin, almost bezel-less design form with rounded edges, which this video also conforms to. Leaked images and news circling this upcoming flagship suggest that the device will sport an A8 processor, 1 GB RAM, tweaked Touch ID sensor, and an improved 8 megapixel camera with Optical Image Stabilization (OIS). 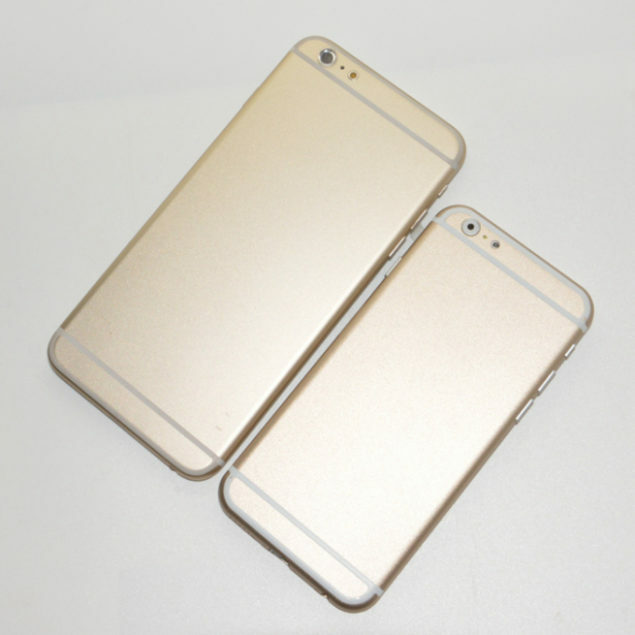 iPhone 6 is also expected to sport a durable sapphire display panel. Software wise, iPhone 6 variants will be powered by iOS 8 featuring new fitness apps with a focus on Healthbook app, an improved Maps and Siri experience, inter-app communication capabilities and more such refinements. iOS 8 is not to see any major design changes this year following past year’s design overhaul, the focus, thus, would primarily be features and functionality.